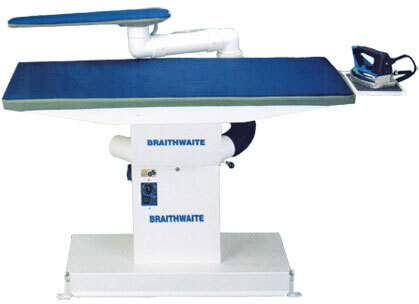 The Braithwaite Tar vacuum table is an ideal partner to the Gak steam generator (or other steam generators) and is for use when you require a dry, clean, pressed garment. It features a 130cm x 60cm electrically heated rectangular ironing surface which is thermostatically controlled to help reduce pressing dampness and a powerful self-contained vacuum motor; which draws the steam through the garment giving professional finished results which last longer and are quicker to achieve. As standard it comes with a floor level foot kick plate, which operates the vacuum, leaving both hands free, a high temperature iron rest and pre-fitted upgrade port for adding optional extra's. Also available is the TAR-H height adjustable industrial vacuum table. This is similar to the TAR table and comes fitted with a height adjusting column, which has a range between 780mm and 940mm (at 40mm intervals). This allows you to set the tables working height to suit an individual operator including: the tall or small user, who may find other restricted height tables uncomfortable when used for long periods of time. Tar vacuum pressing/ironing table for use alongside industrial steam irons. Designed & manufactured in Europe to strict quality standards (beware of far eastern "Look alike" copies).